Department of Biochemistry, Bahauddin Zakariya University, Multan, PAKISTAN. Institute of Chemical Sciences, Bahauddin Zakariya University, Multan, PAKISTAN. Department of Chemistry, University of Education, Vehari, PAKISTAN. The study was designed to investigate the effect of heating in the simple oven and microwave treatment on phytochemical composition and antioxidant potential of ginger (Zingiber officinale R.), a popular food ingredient of medicinal importance. Dried ginger was ground to fine powder and subjected to heating in the simple oven and microwave oven in an increasing order of heating time (5, 10, 15, 20 and 25 min). The heat-treated samples were extracted in methanol and analyzed for their phytochemical composition and antioxidant potential. A time-dependent significant (p<0.05) negative effect of both treatment methods was observed on total phenolic acids (TPA), total tannins content (TTC), total flavonoids content (TFC), total antioxidant activity (TAOA), 2, 2-diphenyl-1-picrylhydrazyl radical scavenging capacity (DPPH RSC) and hydroxyl radical scavenging capacity (HRSC). Both treatments methods showed the significant positive effect on β-carotene bleaching capacity (BCBC), reducing power (RP) and iron chelating activity (ICA). TPA and TAOA of oven heated, TTC and RP of microwave-treated and TFC, BCBC, and HRSC of ginger varied exponentially while TTC and RP of the oven heated, TPA and TAOA of microwave-treated and ICA and DPPH RSC showed linear variation in response to treatment time. Both heating methods have a significant time-dependent effect on the phytochemical composition and antioxidant activity of ginger. This study provides useful information to the manufacturers and consumers regarding the potential benefits of ginger and effect of various heat treatments methods on its medicinal value. Ginger is a popular ingredient used in the preparation of numerous foods and has a valuable part in pharmaceutical formulations. The heating treatments during the cooking and pharmaceutical processing were hypothesized to affect the nutritional and medicinal value of ginger. The hypothesis was proved to be true and the study has shown that the heating methods have a significant time-dependent effect on the phytochemical composition and antioxidant activity of ginger. The study would be helpful to the manufacturers and consumers in selection of suitable heating methods for ginger-based food recipes and pharmaceutical processing to avoid the loss of its biological potential. The present study was designed to study the comparative time-dependent effect of heating in the simple oven, a conventional heating method, and steam-free heating in microwave oven on the phytochemical composition antioxidant activity of ginger. The data would be a significant contribution to current research on the thermal and microwave stability of phytochemicals in ginger. Ginger rhizome was purchased from the local market, washed in distilled water, cut into pieces with a sharp knife and dried under shade in the flow of fresh air until constant weight and minimum moisture content (2.5-3%). The dried sample was ground to a fine powder using an electric grinder (National Juicer Blender & Grinder JPN 176, Japan) at low speed (1000 rpm) to avoid temperature fluctuation during grinding. The ground sample proceeded for oven heating and microwave treatment. The ground sample was subjected to oven heating and microwave treatments each at five treatment times (5, 10, 15, 20 and 25 min). The treatment times were selected after an initial experiment in the range prior to combustion of the sample. The oven heating was done in a simple oven at a constant temperature (150°C) while microwave treatment was done in a microwave oven (Microwave-Orient-OMW-720-ADL). The operating conditions for microwave treatment were selected as radiation intensity: at medium intensity (Power level P50: 400W, Equivalent to 150-160°C), sample mass per load: 5g, treatment duration: as selected by experimental design. The treatment was discontinued after each 5 min for 30 secs and the sample were mixed thoroughly to avoid the burning. After heat treatment, the samples were soaked in 80% methanol (sample to the solvent ratio 1:20) and kept at room temperature (25±3°C) in dark for 24 h. The extract was obtained by filtration and evaporation of the solvent. The solvent-free extract was stored in glass bottles covered with aluminum foil in at sterile and thermally controlled standard laboratory conditions. The dried extract (0.1g) was dissolved in methanol (100 ml) and proceeded for phytochemical and antioxidant analysis. The chances of photo-oxidation of phytochemical compounds were minimized by protecting the samples from direct sunlight exposure throughout the study period. Total phenolic acids (TPA) in ginger were estimated by the method of by Slinkard and Singleton.18 The total phenolic acids were calculated as gallic acid equivalent (g/100 g dry weight using the linear regression equation [TPA (g/100 g dw.) = Absorbance at 720 nm/0.485 + 0.089] from the standard curve of gallic acid (R2 = 0.974). Total flavonoid content (TFC) was estimated according to the previously reported method20 with slight modification. Methanolic extract (1 mL) was diluted to 4 mL with methanol followed by the addition of 2% sodium nitrite solution (0.3 mL). After 6 min 10% Aluminum nitrate solution (0.3 mL) and 4% sodium hydroxide solution (4 mL) was added and allowed to stand at 25±2ºC for 12 min and absorbance was measured at 510 nm against blank. The contents of total flavonoids were calculated as g/100 g dry weight using regression equation obtained from a standard curve of catechin (R2=0.995). Gallic acid equivalent total antioxidant activity (TAOA) was evaluated by Phosphomolybdenum assay.21 This method is based on the reduction of Mo (VI) to Mo (V) by antioxidants and the formation of a green phosphate/Mo (V) complex λmax at 695nm. Total antioxidant activity was calculated as mg equivalent/100 g of gallic acid using regression equation [TAOA (g Eqv./100 g gallic acid) = Absorbance at 695nm/1.25 − 0.13] obtained from the standard curve of gallic acid (R2 =0.995). The reducing power (RP) of samples was determined by the method of Oyaizu (1986). A higher absorbance indicates a higher reducing power. Where A0 = absorbance control and A1 = Absorbance of the mixture containing the extract. Where Abs120min is absorbance of the mixture after 120 min of assay and Abs0 is absorbance of initial β-carotene. The results were expressed as the mean ± standard deviation of three parallel replicates. Significant variation among the results obtained at different treatment times was analyzed by one-way analysis of variance (ANOVA). The data were analyzed by regression analysis to study the effect of heat treatment on phytochemical composition and antioxidant properties. The results of phytochemical composition, antioxidant activity and free radical scavenging capacity of methanolic extracts of untreated ginger are presented in Table 1. TPA, TTC, and TFC were found to be 0.68, 0.28 and 3.9 g/100 g dw respectively. Antioxidant activity of the ginger extract was determined in terms of gallic acid equivalent TAOA by phosphomolybdenum assay, BCBC, RP, and ICA which were found to be 1.54 g/100 g dw, 11.76%, 0.02 (in terms of absorbance at 700 nm) and 8.03% respectively. The ability of ginger extract to inhibit the free radicals, determined in terms of DPPH RSC and HRSC, found to be 85.88 and 37.36% respectively. Phytochemical composition, antioxidant activity and free radical scavenging capacity of methanolic extracts of untreated ginger. Ginger was heated in the simple oven and microwave oven to study the effect of oven heating and microwave treatment on its phytochemical composition, antioxidant activity, and free radical scavenging capacity. The regression analysis of the data showed statistically significant variation (p<0.05) in all the studied parameters of ginger subjected to either treatment method. A significant decrease in phytochemical content, total antioxidant activity and free radical scavenging capacity and an increase in metal reducing, metal chelating and β carotene bleaching abilities was observed in response to an increase in treatment time (Table 2). 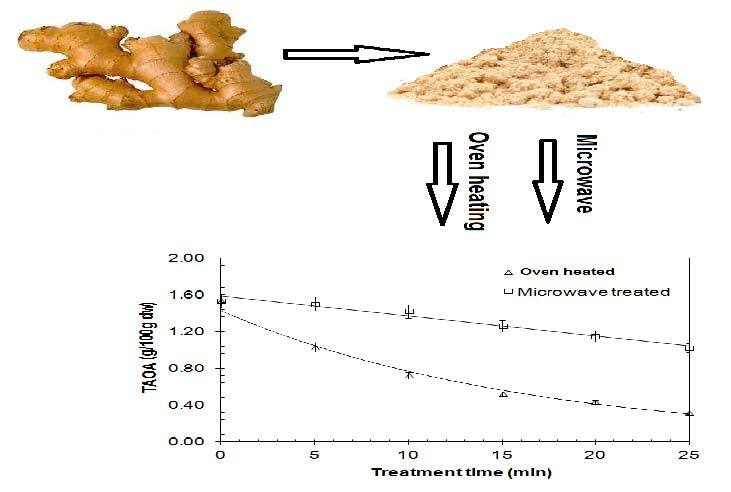 TPA, TTC, and TFC of an oven heated and microwave treated ginger was found to be decreased from 0.68 to 0.007, 0.28 to 0.082 and 3.93 to 1.44 g/100 g dw respectively in response to an increase in treatment time (Figure 1a-c). 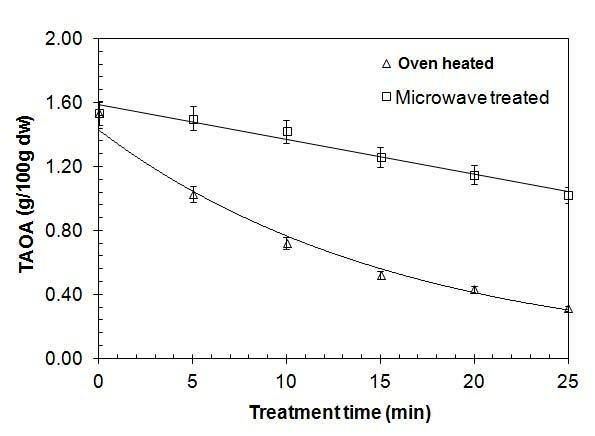 The oven heating of ginger showed an exponential decrease in TPA and TFC and a linear decrease in TTC (R2 = 0.969–0.996) while microwave treatment resulted in a linear decrease in TPA and an exponential decrease in TTC and TFC (R2 = 0.971–0.989). Time-dependent response of a) total phenolic acids, b) total tannins content and c) total flavonoids content of methanolic extracts of oven heated and microwave treated ginger. *Error bars show the standard deviation of three parallel replicates. Regression equations, regression coefficients and p-values of obtained from the regression. Analysis of experimental data. Gallic acid equivalent TAOA in an oven heated and microwave treated ginger was found to be decreased from 1.54 to 0.31 and 1.54 to 1.02% respectively (Figure 2). BCBC of both the oven heated and microwave treated ginger was increased from 12-31 and 12-25% respectively (Figure 3a). RP and ICA of oven heated ginger were increased from 0.02-0.13 and 8.03 to 16% while those of microwave-treated ginger was increased from 0.02 to 0.09 and 8.03 to 29% respectively (Figure 3b, c). Effect of oven heating was found to be exponential on TAOA and BCBC and linear on RP and ICA (R2 = 0.965–0.996). However, the microwave treatment resulted in the linear effect on TAOA and ICA and an exponential increase in BCBC and RP (R2 = 0.962–0.997). Table 2. Time-dependent response of Gallic acid equivalent total antioxidant activity (TAOA) of methanolic extracts of oven heated and microwave treated ginger. Time-dependent response of a) β-carotene bleaching capacity (BCBC), b) metal reducing power (RP) and c) iron chelating activity (ICA) of methanolic extracts of an oven heated and microwave treated ginger. DPPH RSC of the oven heated, and microwave treated ginger was found to be decreased from 85.88 to 40.96 and 85.88 to 20.99% respectively while HRSC was decreased from 37.36 to 4.49 and 37.36 to 14.40% respectively with an increase in treatment time (Figure 4a, b). Both treatments showed the linear negative effect on DPPH RSC and exponential negative effect on HRSC (R2 = 0.974–0.985). 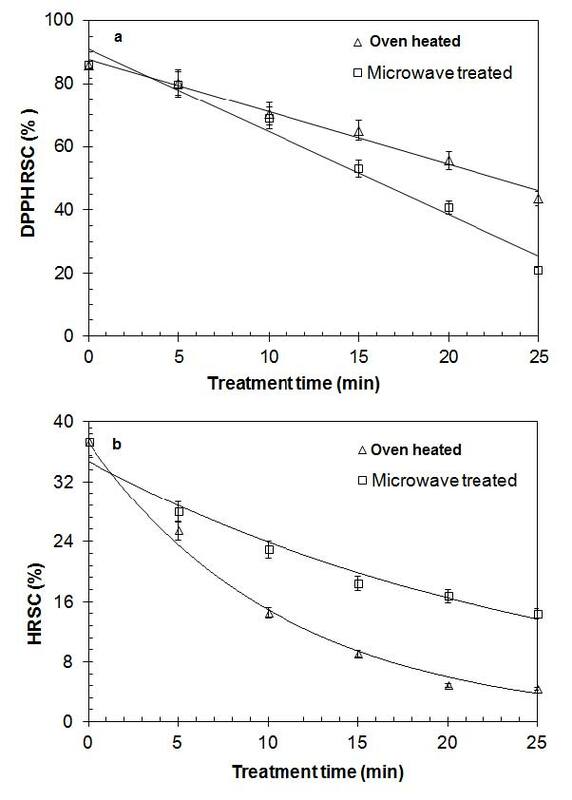 Time-dependent response of a) DPPH radical scavenging capacity (DPPH RSC) and b) hydroxyl radical scavenging capacity (HRSC) of methanolic extracts of oven heated and microwave treated ginger. Ginger is used as a spice in various foods in the world, particularly in continental and Chines recipes, to enhance the taste and quality of the food products. It is also used as an active ingredient of food due to its important biological activities. It is widely used in pharmaceutical formulations due to the presence of antioxidant phytochemicals of medicinal importance. The nutritional and medicinal quality of plant material entirely depends on the processing conditions and methods. Various processing methods such as boiling, frying, oven heating and microwave treatment have been adapted for the preparation of various food and pharmaceutical products. Microwave heating has been found to be effective in improving the nutritional quality of starch and protein-based food products and phytochemical and antioxidant based pharmaceutical value of fruits and vegetables.26,27 Some studies are evident that prolong microwave heating decreases the content and biological activity of bioactive phytochemical components of food material due to their thermal degradation.15,28 Therefore, in continuation of the studies on the effect of microwave treatment on the quality of food and pharmaceutical products, a comparative study was designed to investigate the effect of oven heating and microwave treatment methods on the phytochemical and antioxidant potential of ginger. The decrease in phytochemical content in response to an increase in the treatment time in both cases may be attributed to the thermal degradation of the heat-sensitive bioactive phytochemical compounds present in ginger. Prolonged oven heating and thermal treatment at high temperature may cause the structural changes due to thermal degradation of phytochemical constituents resulting in a decrease in their extraction yield in a extracting solvent. It may also decrease the bioavailability and antioxidant potential of these constituents as a part of food products.15 Microwave heating uses electromagnetic radiation possessing both electric and magnetic fields. The electric field makes the molecules of the sample to vibrate or oscillate due to dipole moment and ionic induction which results in the fast heating of sample.30 Prolonged heating in this field may result in the electromagnetic disruption of intermolecular and intramolecular hydrogen bonds causing an alteration in the structure and activity of bioactive molecules. The structural changes in the antioxidant phytochemicals such as conjugated polyphenols, phenolic acids, flavonoids, tannins and some vitamins may influence the antioxidant potential of these compounds. The increase in β-carotene bleaching capacity, metal reduction, and metal chelating activity may also be attributed to microwave induced structural changes in phytochemical compounds of ginger. Both heating treatment methods were found to have a significant effect on the phytochemical composition and antioxidant activity of ginger. The heating treatments resulted in a time-dependent decrease in phytochemical composition, total antioxidant activity, and free radical scavenging activities. However, the effect of microwave treatment was found to be comparatively more significant on TPA, TFC, TAOA, ICA and DPPH RSC of ginger. This study provides useful information regarding the potential benefits of ginger and effect of various heat treatments and processing methods on its medicinal value. The study may also be helpful to the manufacturers and consumers in selection of a suitable heating method for ginger based pharmaceutical extraction and cooking of food recipes containing ginger as an ingredient. The authors are grateful to Institute of Chemical Sciences, Bahauddin Zakariya University, Multan, Pakistan for providing the laboratory facilities throughout the experimental work. There is no conflict of interest regarding this study. Sun H, Mu T, Xi L, Song Z , authors. Effects of Domestic Cooking Methods on Polyphenols and Antioxidant Activity of Sweet Potato Leaves. J Agric Food Chem. 2014;62(36):8982–9. doi:10.1021/jf502328d. Ghasemzadeh A, Rahmat A, Jaafar HZE, Swamy MK , authors. Optimization of microwave-assisted extraction of zerumbone from Zingiber zerumbet L. Rhizome and evaluation of antiproliferative activity of optimized extracts. Chem Cent J. 2017;11(1):5doi:10.1186/s13065-016-0235-3. Nn A , author. A Review on the Extraction Methods Use in Medicinal Plants, Principle, Strength and Limitation. Med Aromat Plants. 2015;4(3):1–6. doi:10.4172/2167-0412.1000196. Effect of roasting and microwave treatment was found to be significant on studied parameters. Both of the heating methods showed negative effect on phytochemical content and antioxidant activity. Both of the heating methods showed positive effect on metal reducing, chelating and β-carotene bleaching activity. Microwave treatment showed more significant effect on phytochemical content and antioxidant activity. Haq Nawaz, is Doctoral student in Institute of Chemical Sciences, Bahauddin Zakariya University, Multan, Pakistan. He is also working as Lecturer and Research supervisor at Department of Biochemistry of the same University. He is working in the field of biological sciences with special interest in Food Sciences Antioxidant chemistry and Clinical sciences. Copyright statement: Copyright: 2018 Phcog.Net. This is an open-access article distributed under the terms of the Creative Commons Attribution 4.0 International license. Cite this article: Nawaz H, Shad MA, Aziz AR, Muntaha ST, Muzaffar S. Phytochemical Composition and Antioxidant Potential of Oven Heated and Microwave Treated Ginger (Zingiber officinale Roscoe). Free Radicals and Antioxidants. 2018;8(2):89-5.